I am delighted to have the opportunity to welcome you to the official website of the Masonic Province of Antrim. 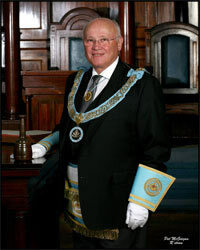 The purpose of this website is to provide a broad overview of Freemasonry in our Province and to set out the principles of our Order, along with our history and information about the lodges and their activities, and in particular the charitable work which is undertaken. Although the website is mainly for the dissemination of information to our Brethren at home and abroad, you are very welcome to enter the site and my hope is that your visit will be interesting and informative. I also invite you to make contact with us for further information relating to the Province of Antrim or Freemasonry in general. Freemasonry instils in its members a moral and ethical approach to life: it seeks to promote thoughtfulness to others, kindness in the community, honesty in business, courtesy in society and fairness in all things. Our membership of over six thousand from all ethnic, cultural and social backgrounds meet regularly in harmony and friendship at lodge meetings and at a range of associated events and functions. We encourage our members to use our site regularly so that they will be aware of forthcoming events and to peruse items of news and interest. Our administration office in Rosemary Street welcomes news, stories and photographs about all the events and activities in which the Brethren are involved: such information will be included on the website and will also be available in hard copy.
. © All content remains Copyright PGL Antrim unless stated © .